As Christmas approaches, i believe some of you are already busy preparing for dinner or gathering which involves decorating your home, packing gifts, choosing what to wear, and so on. Here too, I have been thinking of some christmas theme for this year, and i go with metallic (both gold and silver), with hint of grey and red. I wanted something that is not too matchy matchy - a modern mix of metal and natural materials such as wood, cotton, and ceramics. Scroll to see product links and tell me what do you think. 1. Le Creuset oven ware in red $60 via Williams Sonoma multifunction as baking ware and looks good on the table too. 2. Villerov and Boch artesano original dinner plate $20.90 - a polished ceramic for your festive dishes via Villerov and Boch. 3. Snokul christmas tin S$6.90 via Ikea to place your christmas cookies delight. 4. Ellipse Lysestager contemporary silver candle holder set by Georg Jensen $183 via Illums Bolighus. 5. Murphy Blue Napkin to accompany delicious meal S$8 via Crate and Barrel. 6. 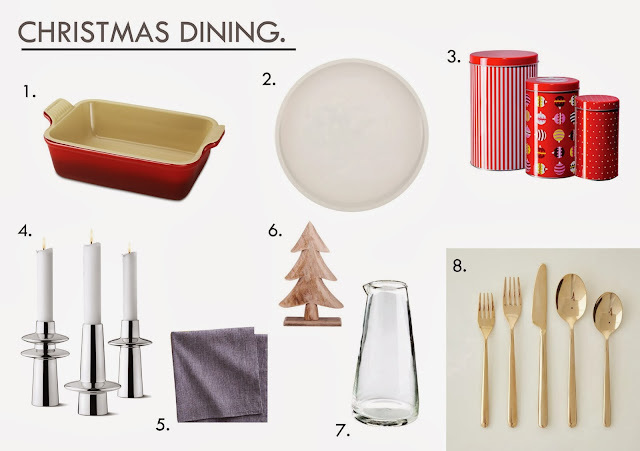 Albi christmas tree in Paulownia wood as your table accent via Broste Copenhagen. 7. GLCan simple glass carafe to present your homemade drinks $37 via TineKHome 8. Rose gold flatware 4 place setting S$140 that elegantly completes your gathering moment via West Elm. This is a great list I will want a few items well done. Can we follow each other via gfc g+ and bloglovin? would you like to follow each other on GFC and G+?